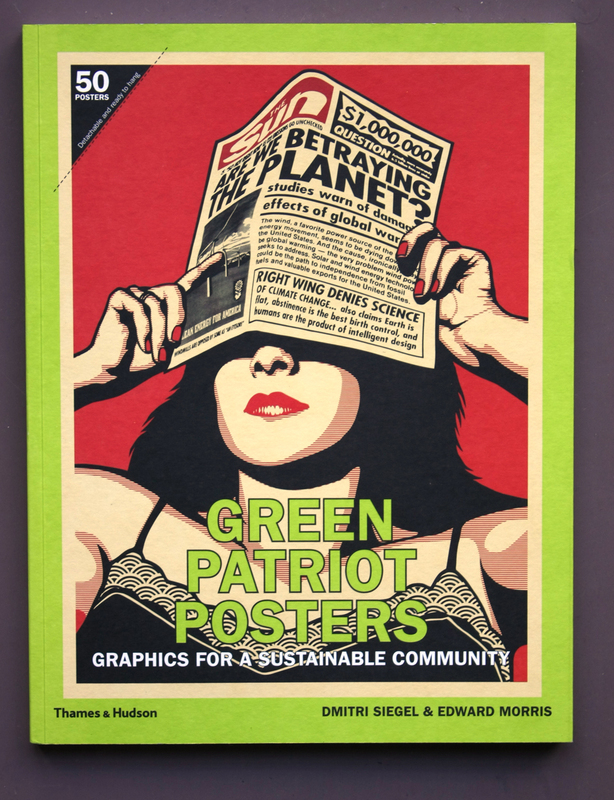 Timely, then, to see the release of Green Patriot Posters: Graphics for a Sustainable Community (eds. Dmitri Siegel & Edward Morris, Thames and Hudson £19.95, top). 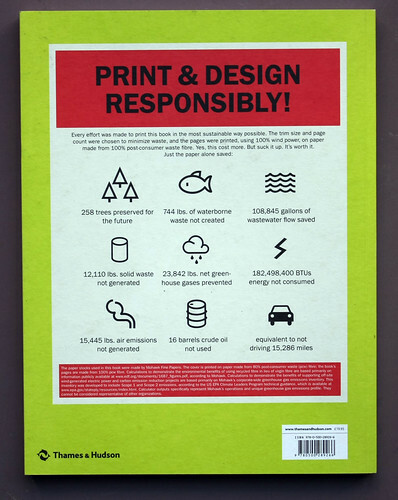 It’s a whole book-full of pithy posters, designed to spark eco-idlers into action. 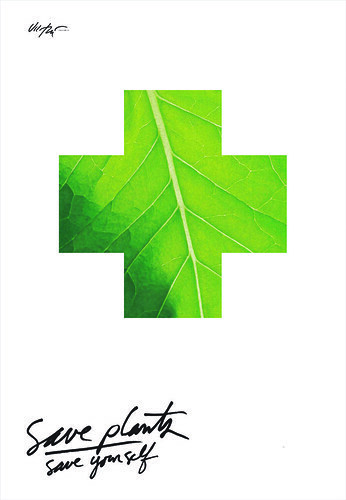 Trying to raise the profile of environmental issues is a laudable cause, and the production of the book (using a list of specifications so noble that the cost of printing required subsidy from donations for the book to be produced) is admirable. 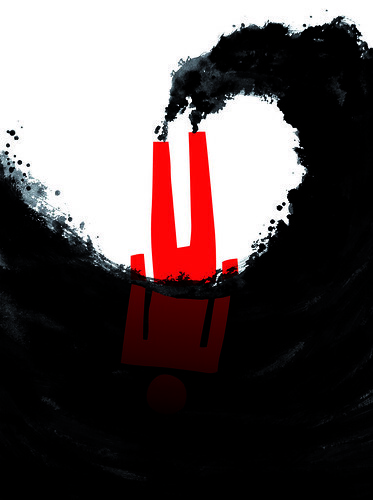 Climate change however, like any other ‘big issue’, is tricky to communicate and promote. It possesses an intrinsic ‘us & them’ dichotomy – you’re either part of the solution or part of the problem – which makes it very difficult to avoid simply patting yourself on the back or further patronising and alienating the ‘other side’. Problems with GPP begin small. The book features a number of perfunctory essays on the aims of the organisation, but the type treatment, along with the tight margins (a waste-cutting measure) makes for an uncomfortable read. When turning to the posters, you’re instantly confused by the credits. The idea is that you’ll tear out the pages and hang them, meaning the captions facing an image are actually for the image on the previous spread. Unfortunately, there are only a couple of images that merit such action. Despite pieces from a broad spectrum of contributors including Paul Elliman (see profile in Eye 25), Shepard Fairey (see review in Eye 62) and James Victore (below, whose monograph was reviewed in Eye 77), the work is of mixed quality. 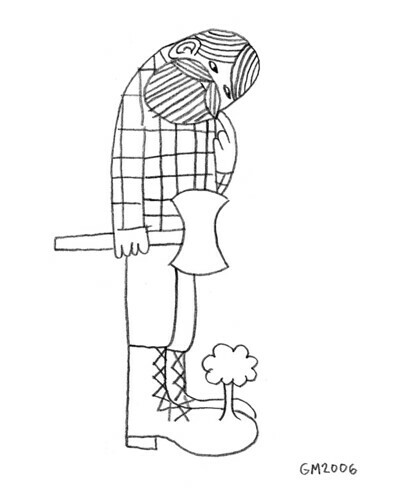 For every highlight – Geoff McFetridge and Frederic Tacer’s offerings (both above) stand out – there are ten others that don’t match up. For all the team’s commendable efforts to produce this book with as little waste as possible, one can’t help but think it would have been greener had they not made it at all. I don’t mean this churlishly. There are numerous outlets that could have done better service to the project. On page, the posters are divorced from their purpose, you get no sense of the impact the work is intended to possess, and even those pieces which you might want on your wall are, when torn out, disappointingly small. Print-on-demand is gaining in popularity and quality, and services such as Print-Process in the UK would allow customers to have a single poster printed to order at a worthwhile size, without the 49 images they don’t want. While I applaud the intention of GPP, (back cover, below) I don’t think I’ll keep it. However its message hasn’t gone completely over my head. I promise it will be recycled. More information at the project’s website, greenpatriotposters.org and thamesandhudson.com. Eye magazine is published quarterly for professional designers and students. It’s available from all good design bookshops and online at the Eye shop, where you can buy subscriptions and single copies. For a glimpse of the current one, no. 77, see Eye before you buy on Issuu. The new issue, Eye 78, is on its way.